The abbreviated version of this story is that I started having mild contractions the evening before around 10:00 p.m. I went to sleep and they woke me up a few hours later and we ventured over to the hospital around 3:00 a.m. to find that I was already 5 cm dilated. After 8 hours of labor, I was no further dilated, but then BAM, in the next hour and a half I went from 5 to 10 cm dilated. 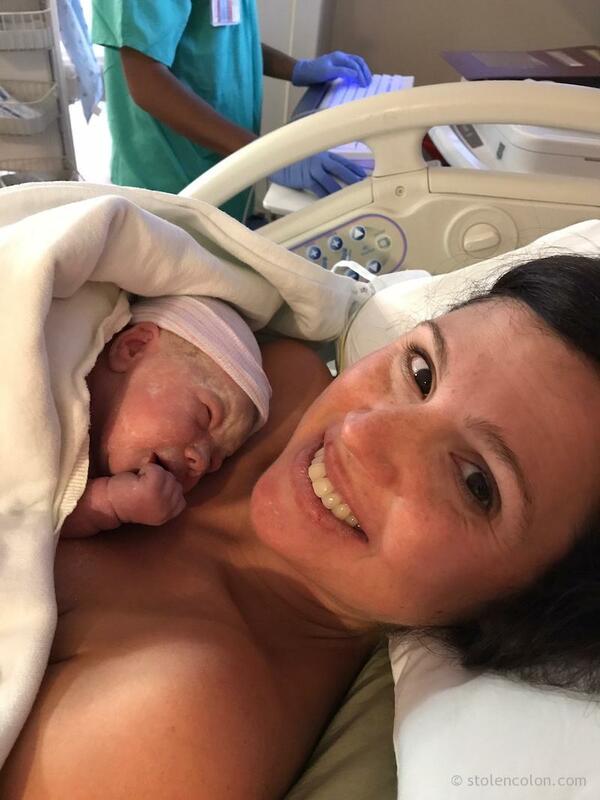 I started pushing at 1:01 p.m. and she officially entered the world at 1:07 p.m. (Trust me, it was not the same story with my first.) She weighed 7 lbs. 9 oz. at birth. 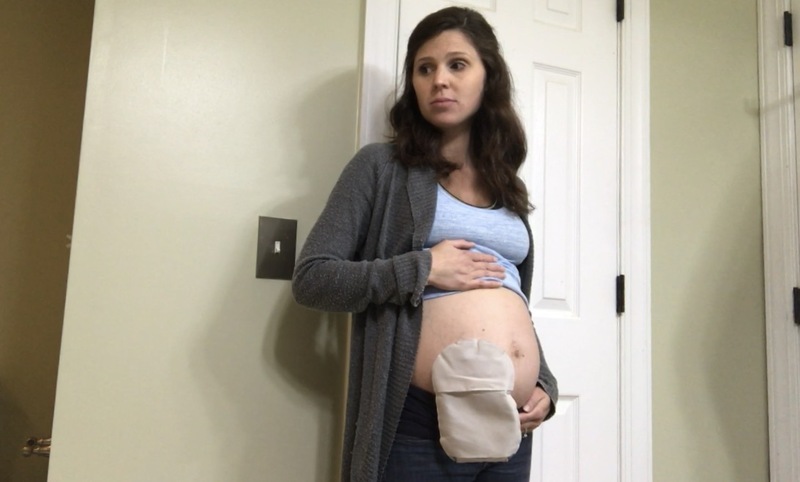 There were no complications with my ostomy during the actual labor and delivery process. It was essentially a non-factor during that time. And thankfully, as was the case with my first, my body seemed to get back to normal as soon as she was born. I was able to start eating the same foods I had prior to pregnancy with no blockage issues! It’s taken a few weeks, but my stoma is getting back to normal. It was still fairly large for the first couple of weeks and I was concerned that it might not return to its normal size, but at 9 weeks postpartum it seems to be pretty close to the size it was originally and not prolapsed like it had been during my pregnancy. Chandler has been doing great, as well. We were able to come home just 24 hours after her birth. She’s been growing like a champ and getting more personality by the day. I’ll be sure to share a little more about the final weeks of my pregnancy with an ostomy and attempting to avoid another blockage but know I am so thankful that I was able to avoid any further complications with my ostomy and any more hospitalizations. I wanted so much to be able to deliver as a result of spontaneous labor and I was able to achieve that goal, but it definitely wasn’t easy. These past few weeks have been a big adjustment as I’m now living with a high-energy 2-year-old and an infant. I hope as we get more settled that I can get back into a good routine of sharing information and keeping in contact with all of you. I apologize to anyone that I have not responded to recently and I hope to be in touch soon. Thank you for all of your support and well wishes! 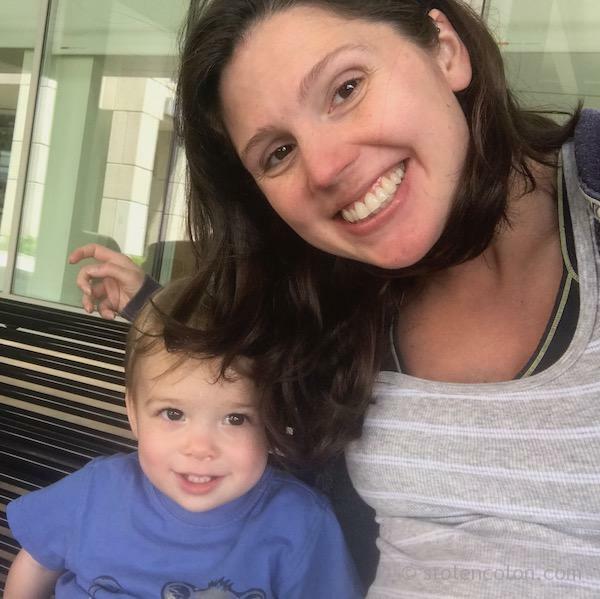 This entry was posted in Inflammatory Bowel Disease, Motherhood, OstoMOMmy, Ostomy, Pregnancy, Stolen Colon, Ulcerative Colitis and tagged birth, children, colon, colon bag, Crohn’s disease, delivery, family, goals, health, IBD, ibd blog, ileostomy, ileostomy bag, ileostomy blog, kids, labor, ostomy bag, ostomy blog, parenthood, stoma on September 13, 2017 by Stephanie Hughes. Just a few days shy of being 28 weeks pregnant I got a bowel obstruction. Intestinal blockages are something I dealt with during my first pregnancy which resulting in my son being born at almost 36 weeks. (You can read more about my experience with blockages and my son’s birth story.) This time, the issue came up a full month before it had my previous pregnancy, which really threw me off. I had prepared for the possibility of a blockage and had determined to switch up my diet at 30 weeks, in hopes of preventing one from occurring, but obviously this one did not wait that long. I woke up in the morning feeling horrible and I called my mom to pick up my son because I knew I would not be able to take care of him. I was hopeful that with some bowel rest, physical rest and hydrating that things might start to clear up. I was actually a little unsure as to whether or not it was a bowel obstruction because of where the pain was. 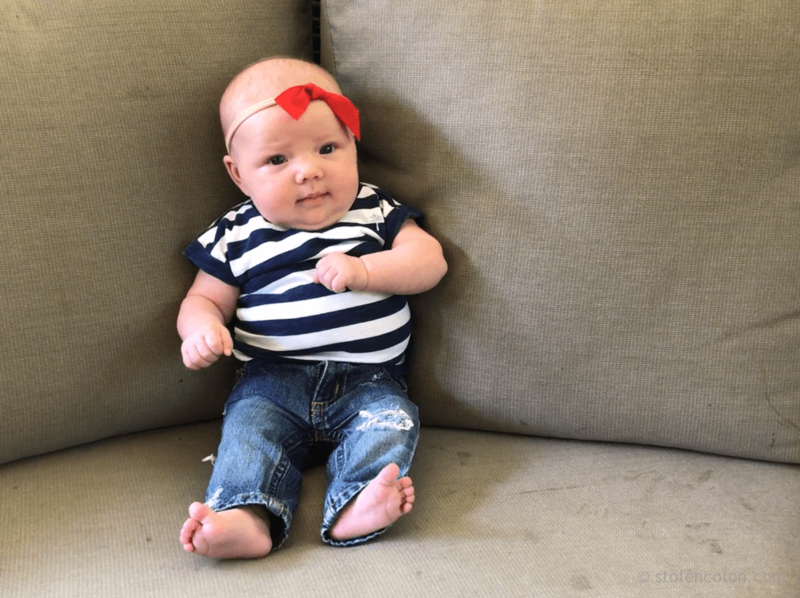 With my first pregnancy, the obstruction was just a few inches from my stoma, so the pain was concentrated in the lower right portion of my stomach. This time, it was across the top of my stomach. I ended up spending the entire day in bed, but things only felt worse as the day went on. I was in pain, throwing up, and could hardly stand up. I actually ended up calling an ambulance to take me to the hospital, which was the first time I’d had to do that since my surgery. I had hoped that by traveling in an ambulance that I would get checked right into the ER, but that was not the case and it ended up being a much bigger deal because they did not want to transfer me to the Women’s Hospital at this point, which is where I went with any issues during my first pregnancy. But I won’t bore you with all of the details of finally getting admitted to the right place for both me and the baby. Once I did admitted to the Women’s Hospital, the first order of business was getting fluids and a fabulous NG tube. (I’ve written about getting an NG tube previously, so I’ll refer you back there for more on that experience, because this one was pretty much the same.) There were lots of tests those first few days, which included a couple of X-rays and a CT scan. As a pregnant woman, this is a difficult decision to make on how to handle the need for radiation, as it can be harmful to the baby. Thankfully, I was already in the 3rd trimester at this point, which means the baby’s internal organs are formed and the radiation poses much less of a risk. I still did not like having to go through that, but I also know that I have to be healthy in order to provide what my baby needs. The CT scan showed just how blocked up I was. The doctor showed me the pictures and my entire small intestine looked like fat sausages (that’s the best way I can think of to describe it). I have no idea what a healthy intestine looks like on a CT scan, but even I could see that this was not what it was supposed to look like. And that explained why I was having pain across the top of my stomach, because that’s how far the blockage extended. I do not remember a whole lot from the first days, but I know by my fourth day there they tried inserting a catheter into my stoma, which is what they ended up doing with my previous pregnancy. This helped incredibly and I finally started getting some output from my stoma and some relief from the pain. The next day they were able to remove the NG tube and I started being able to consume some liquids and eventually some very bland hospital food. Thankfully, things continued to improve over the next couple of days, and even though I was still in a lot of pain, I was able to function. Of course during this whole time they were monitoring my baby closely, but thankfully there were no complications in that capacity. I was dealing with some mild contractions while I was there, which is likely due, at least in part, to dehydration and just to the stress of the situation. It was not anything that turned into an actual issue. Honestly, the baby seemed very unfazed by the whole ordeal. I ended up spending 7 days in the hospital with this blockage. It is actually pretty amazing that I was able to avoid surgery considering how blocked up my small intestine was. I am so thankful that it was able to pass due to the NG tube and the catheter without having to go through a surgical procedure, especially at 7 months pregnant. Probably the most difficult part was being without my son for that time. I stay home with during the week, so it’s usually just me and him, and it felt horrible not being able to be there for him during this time. He finally was able to come visit me once I started feeling better. I’m grateful to my amazing family who stepped up and made sure he was taken care of during this time. In the end, I left with a new low fiber diet plan and a catheter sutured to my stomach, but more on that later. This entry was posted in Inflammatory Bowel Disease, OstoMOMmy, Ostomy, Out of the Bag, Pregnancy, Stolen Colon, Ulcerative Colitis and tagged bowel obstruction, colectomy, colon, colon bag, Crohn’s disease, health, hospital, IBD, ibd blog, ileostomy, ileostomy bag, ileostomy blog, intestinal blockage, ostomy bag, ostomy blog, pain, recovery, surgery on June 29, 2017 by Stephanie Hughes. 5 years: The resentment anniversary? It has been 5 years since I had my surgery to get an ostomy. It’s funny, I’ve been looking forward to this day because 5 years seems like such a good marker of time. And my ostomy has made such a profound impact on my life, that I felt like it would be a time to celebrate. Five years of not living with active Crohn’s disease; five years of being able to take part in the activities I want to; five years of not living in fear of finding the closest bathroom. But this has ended up being an interesting anniversary for me. If you look back at my previous anniversary posts (One, Two, Three, Four), they are mostly filled with gratitude and hope. This year, I feel a bit more resentful and not wanting to celebrate my ostomy or what it has given me the past few years. I have not gotten into it yet on my blog, but I will soon tell you the full story of my second pregnancy and the complications that I have been having due to my ostomy. In a nutshell, I just returned home from spending a week in the hospital due to a pretty severe intestinal blockage. It’s actually pretty amazing that I did not end up requiring surgery in order to relieve it. Currently, I have a catheter inserted into my stoma to help ensure it does not collapse or get squashed between my uterus and my abdomen. It’s painful. It’s uncomfortable. I feel exhausted. And now I am on a nearly entirely liquid diet, which is not only boring, but I’m hungry pretty much all of the time. Plus, I’m worried about getting enough calories during the day, not only to support myself, but to support my baby, too, who is not due for another 11 weeks. Top it off with a 2-year-old who I am home with much of the time and just don’t feel I have the energy to keep up with him, and it’s also difficult to move too much without hurting myself. Suffice it to say I’ve been feeling pretty sorry for myself recently. I think I’ve been going through a mourning period of having to let go of the plans I had for this pregnancy and the hopes I held onto for a spontaneous birth close to my due date. I had wanted to spend these final weeks relishing the time I have with my son before he’s joined by a sibling and enjoying our life as a family of three. But none of that is going to happen the way that I had planned. But you know, I’ve also realized that life usually does not go the way you planned. I am not the first woman to deal with complications during pregnancy or concerns about taking care of her other child. I also see how blessed I am that we’ve been able to handle the issue with this catheter, despite how uncomfortable it is. I am blessed to be home with my family, able to move around, and I’m not confined to bed rest at the hospital for weeks, as many women deal with during pregnancy. I am blessed to have amazing family and friends close by who have dropped everything to help us out and make sure that we have everything we need. So instead of being resentful today, I am trying to focus on the many positives that I have going on in my life: I have a beautiful new baby on the way that I am so excited about and my ostomy played a huge part in me being able to do that, other than dealing with the blockage issues I am healthy, I am not confined to a hospital bed, I have amazing support to help me get through the coming weeks. And I know whenever this baby arrives and in whatever fashion that we will cherish the time we have together. When I think back to when my son was born, and the four weeks I had expected to continue being pregnant, I am thankful for that extra time we had together. And I’m glad to live in an area with some of the best doctors and hospitals who I know will take the best care possible of my little one, no matter what happens. This anniversary is a little different from the ones previous, but it may end up being one of the most significant ones I experience. Life is not always going to go the way that you want, and it has a way of trashing many of the best laid plans, but that doesn’t mean that all is lost or that we should just give up. 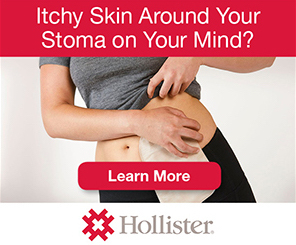 My ostomy has given me a great 5 years, and I look forward to what it will allow me to accomplish and experience in the future, despite the discomfort it may be causing me for the time being. 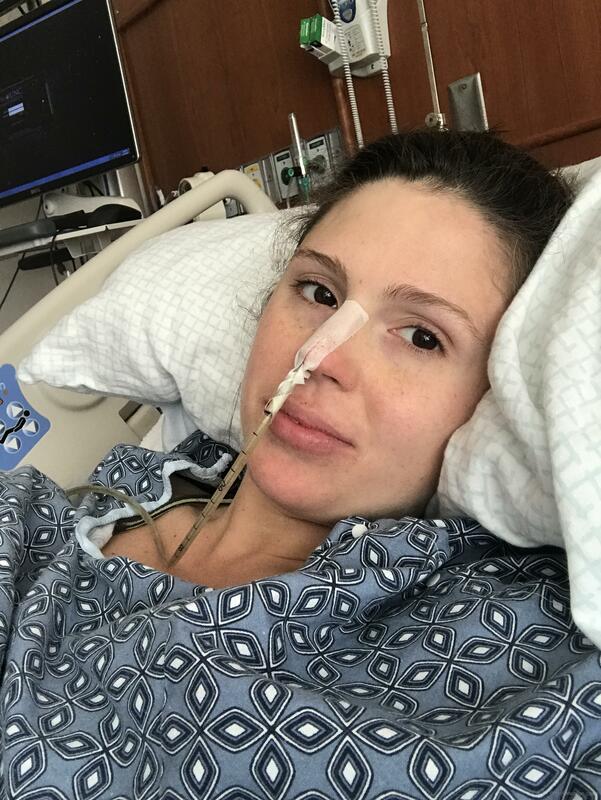 This entry was posted in Inflammatory Bowel Disease, OstoMOMmy, Ostomy, Pregnancy, Stolen Colon, Surgery, Ulcerative Colitis and tagged baby, colectomy, colon, colon bag, Crohn’s disease, family, health, hospital, IBD, ibd blog, ileostomy, ileostomy bag, ileostomy blog, life, ostomy bag, ostomy blog, pain, parenthood, stoma on May 7, 2017 by Stephanie Hughes. Why is it so $@*% hard to get an IV in? I have never been an easy stick when getting an IV. 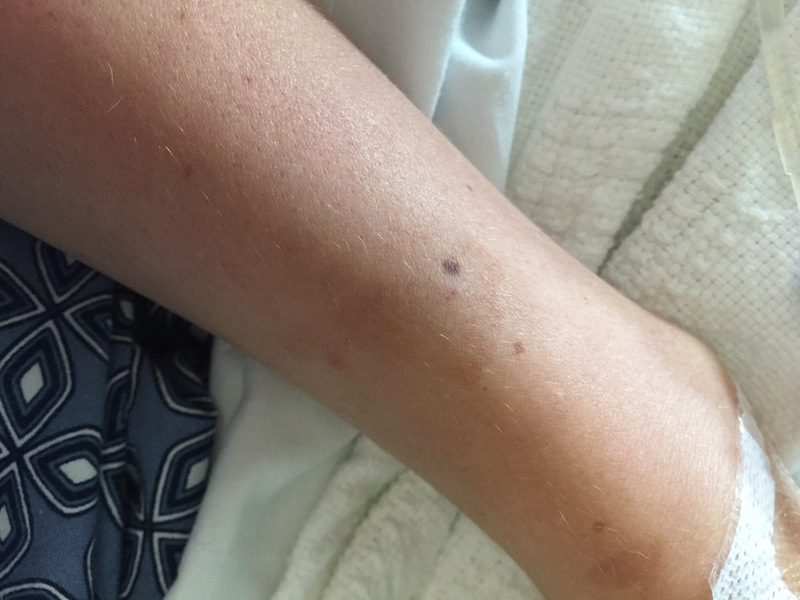 It most often takes about 3 sticks to get one to work, and that’s usually after 5 minutes of one of the needles being moved back and forth trying to figure out where the vein went. I think my record is 6 sticks before finding a vein, but I know that’s probably low compared to some of you. Even the most confident IV … inputters (?) are surprised by how difficult my veins can be to find. I once ended one nurse’s streak of nearly 100 sticks on the first try. I always try to tell the person before hand that my veins are tricky and they like to play hide-and-seek, looking alright beforehand, but disappearing as soon as the needle goes in. They usually somewhat brush me off at first, but by the end they agree with me. During my recent hospital stay, which started as a blockage, by the real reason I went in was due to severe dehydration. I’m sure you all know how much more difficult it becomes to get an IV when you’re dehydrated. The nurses could tell immediately that my veins were not going to make it easy, so I had 2 charge nurses each give it a try and both miss the vein. Then they called the IV team. And it was the same old story: Came in confident, but then not 1, but 2 blown veins later, we finally got a blood return on his third try, but fifth overall. But what’s interesting about this, is what he asked me next. He went on to tell me something that I am surprised nobody has ever told me before. He said that people with Crohn’s disease and ulcerative colitis have notoriously difficult veins to insert an IV into. (Please don’t quote me on some of the more technical aspects here, but this is what he told me.) He said it could be due to a number of things such as some of the medications taken for IBD, getting ongoing IV meds and veins being used frequently for blood draws and other IVs, among other things. He showed me how his veins are mostly straight, but when you look at mine, they are kind of curvy and they have extra little bumps in them, what he called valves. From what I understand, when valves are not working properly, they cause blood to pool is small sections of your veins. Basically, the point of all of this is showing that having IBD can make getting an IV inserted more difficult, since the veins aren’t as straight or smooth as they usually are. I found all of this very interesting and wondered why nobody had ever told me this before. But now I’ll be sure to always give someone trying to insert an IV a heads up of what they’re dealing with. We’ll see if they take it more seriously than my warning of tricky veins! 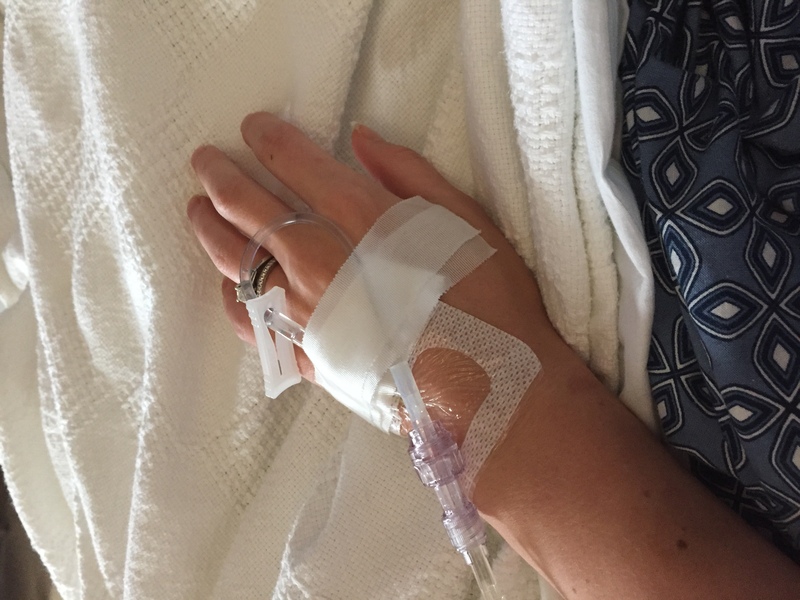 This entry was posted in Inflammatory Bowel Disease, Stolen Colon, Ulcerative Colitis and tagged Crohn’s disease, health, hospital, IBD, ibd blog, IV, medicine, needles, ulcerative colitis, veins on September 27, 2016 by Stephanie Hughes.